Today, we woke up at 6:00am, packed up our equipment and headed to the jeeps to begin the long 7-hour off-road drive to Skardu. Just as we reached the outskirts of Skardu, we were forced to stop the jeep as a crowd of people were in the street along with a few armed police officers. Babar (our Liaison officer) rolled down his window to speak with the police-man to find out what was going on. Just after this, one of the men in the street lunged for another and a commotion broke out. Suddenly, we heard the crackle of repeated gunfire as more than a dozen shots were fired. We quickly ducked down in the vehicle as our driver sped away. Apparently, we were simply in the wrong place at the wrong time. A land dispute over a very valuable piece of land had taken a violent turn and just as we arrived, escalated to gunfire. According to Babar, three bystanders were wounded in the gunfire. Thankfully, our group escaped shaken, but unhurt. We arrived to our hotel around 3:00pm and after waiting a bit to be sure that the violence wouldn’t spread as it often can in small towns, Babar, Akbar and I ventured out to the hospital to get checked out. The doctor here prescribed me a number of medications for my cough and charged me an alarmingly small fee of US$1.00 (yes, one dollar… it isn’t a typo). After this, I finally had the opportunity to shower in an actual shower and washed the last of the Baltoro off of me. 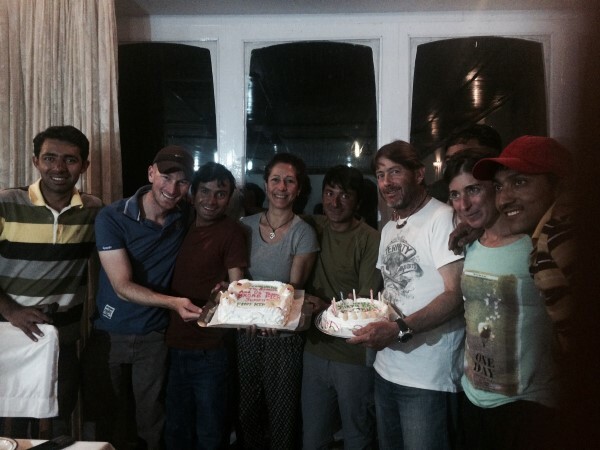 We reconvened for dinner and then Manzoor, Akbar, and Ibrahim surprised us with a summit cake and another for Carlos’s birthday. We celebrated, then went to sleep, exhausted from the day’s events. A peak close to Paiju in the early dawn light. Today, we woke up at 3:00am (to avoid trekking in the heat) and quickly began descending in the pre-dawn hours toward Askole. We knew that today would be long as we had originally intended to arrive to Bardumal rather than to Paiju. In not arriving yesterday, we added 15km/2.5 hours to our already long trekking day. We arrived to Askole destroyed at close to 4:00pm. After spending the better part of the day walking with a heavy pack in the hot sun, my minor cough had turned into a major problem. I arrived with a fever and a productive cough. Thankfully, the heat broke shortly after we arrived to Askole and a torrential downpour began. Badia and Mauricio (Mexico) graciously offered their mess tent as refuge from the storm while we continued to wait for the rest of our equipment to arrive. 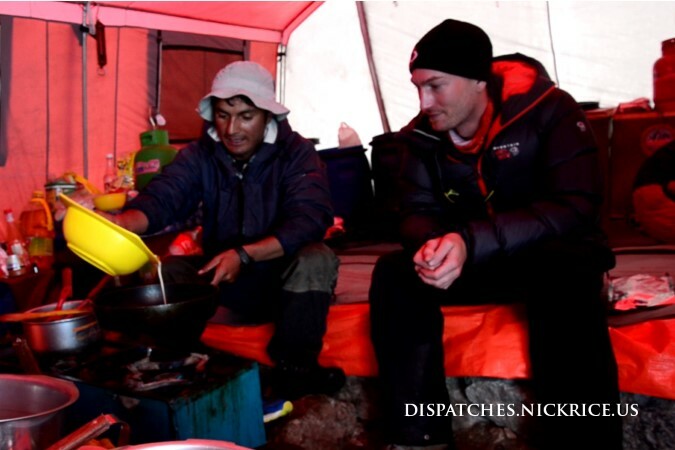 When it finally did, we quickly unpacked the tents and tipped the porters who were eager to go. We settled into the mess tent for our last dinner together in the mess tent, then went to sleep, hoping that the rain wouldn’t cause any massive landslides that would prevent the jeeps from passing through to Skardu in the morning. Today, we woke up around 6am, and again packed up our equipment, had a rushed breakfast in the mess tent, then broke camp and headed down toward Paiju. Originally our plan was to continue onto Bardumal, however, due to the scorching hot temperatures, the porters were too tired (as were we) to continue past Paiju. 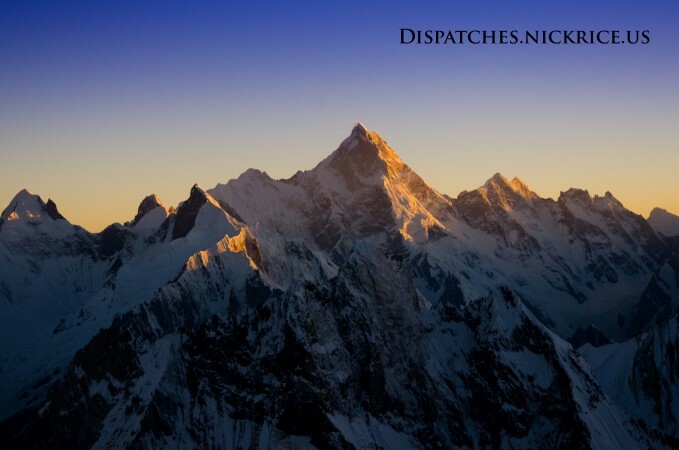 We arrived in the afternoon and after settling in, found out the devastating news that a Spanish climber who’d had dinner with us in Broad Peak base camp, and whom we’d visited in K2 base camp, Miguel Angel Perez Alvarez, had died in his tent in Camp IV after descending from his summit attempt on K2. Exhausted from the trek, and shattered by the news, we went to sleep early. Today, we woke up at 4:00am, packed up our things, ate a quick breakfast, and then began the trek down from Broad Peak Base Camp to Urdukas. The trek ended up taking us 13.5 hours (we had to wait at each camp to make sure that the porters would make it) and we arrived to Urdukas at 6:30pm. The dry cough I’ve had since summitting turned into something else on the trek down and I found it hard to breathe when I had to go uphill (which happens a lot on this trek down). I’m assuming the cough is the result of damage to the lungs from breathing in the frigid subzero dry air for so many hours at night on summit day. Regardless of its origin, I don’t see it getting any better while we are trekking down close to 20 miles a day in the blazing heat of clear August days. It also doesn’t help things that I decided to trek down with close to 25kg’s on my back. But we only have to bear with two more super long days before we are down in Askole. Today, Badia and Mauricio woke me to say goodbye as they headed down toward Askole. 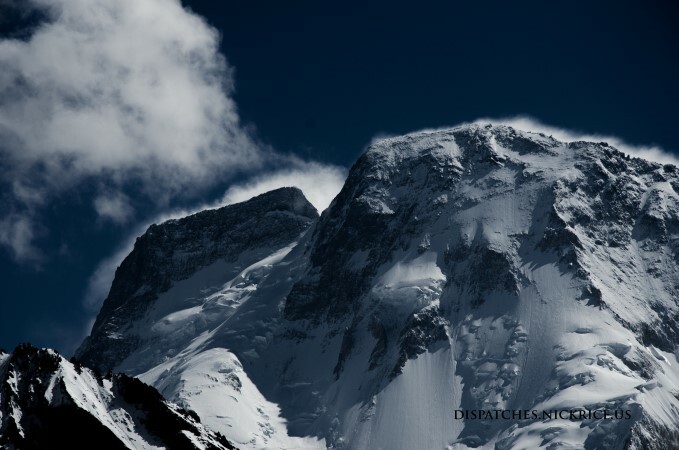 About 20 minutes later, we heard a loud roar from Broad Peak and saw an enormous avalanche sweeping the route to Camp I. Thankfully no one is on the mountain at the moment. We headed to the mess tent for breakfast, then began packing our porter loads for the trek down the Baltoro. We will leave tomorrow and trek to Urdukas. 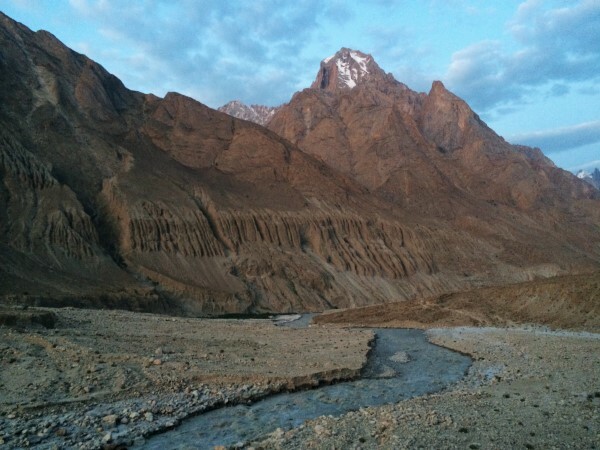 The following day, we will trek to Bardumar, then arrive to Askole on the 31st. We will then take a jeep to Skardu the following day and fly out of Skardu on the 5th (weather permitting) to Islamabad. Today, we woke up in far better condition than yesterday, had breakfast in the mess tent, and then hurried outside as we heard the sound of helicopters approaching. They were here to evacuate Ana, the Catalan team doctor who had come down with severe frostbite on her feet on summit day (they also evacuated Oscar). After this, we began the daunting task of exchanging photos from the expedition in the mess tent. Around lunch time, we heard helicopters yet again and found out that the Taiwanese member who had needed the rescue/dexamethasone injections in Camp IV was also being evacuated via a US $30,000 helicopter ride. After lunch, the Polish team threw a base camp party to celebrate all of our summits. We attended, exchanged information with the teams who were leaving, then visited with Badia and Mauricio. After eating dinner, we discussed the plan to descend via Godogoro La. 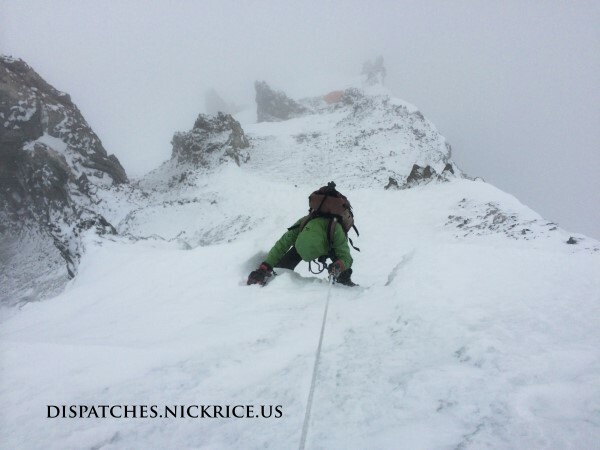 We decided that it was more trouble than it was worth as we would have to fix rope for the dangerous sections and wake up at midnight to reach the pass at dawn. Also weather might be an issue as snow is predicted in the forecast beginning on the 29th. After it was decided that we would descend via the Baltoro, we went to bed. Today, I woke up at 8:00am with a swollen face, swollen lips, and sore everything. I hadn’t slept well at all in base camp and was exhausted. Lina and Pilar both felt awful as well. We found out that Carlos had opted to spend the night in Camp I rather than attempt to cross the rivers late in the day. We ate breakfast, showered and waited for Carlos to return. He arrived in the late morning and upon his arrival, we were relieved that all of our members had made it off of the mountain in one piece. We had lunch together, then I went back to my tent and passed out for the rest of the afternoon. Manzoor woke me when Oriol and Ngima came to visit me and they stayed the evening for dinner. Alex Gavan also came up to say his congratulations and goodbye as he is leaving base camp tomorrow. Badia and Mauricio are still up on the mountain helping rescue the Taiwanese climbers who became exhausted and came down with cerebral edema on the summit. We expect them to return to base camp tomorrow. Today, after a cold and uncomfortable night in Camp III, Lina and I awoke, waited a bit for the sun to arrive to the tent, then broke down camp and began descending toward Base Camp. 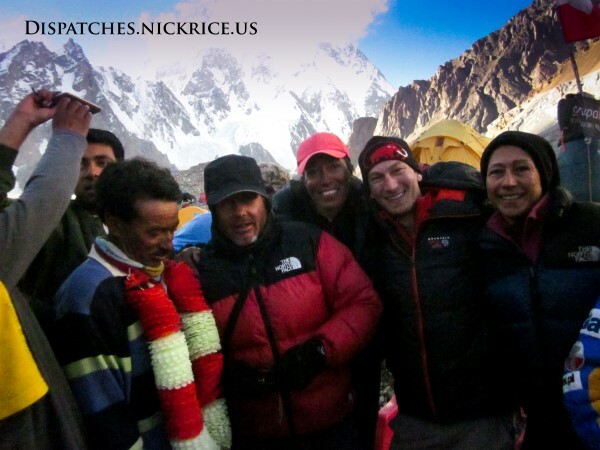 We finally met again in Camp I where we waited for other climbers to begin descending to avoid rockfall danger. We continued our descent until we were greeted by Ibrahim and Manzoor at the deposit. 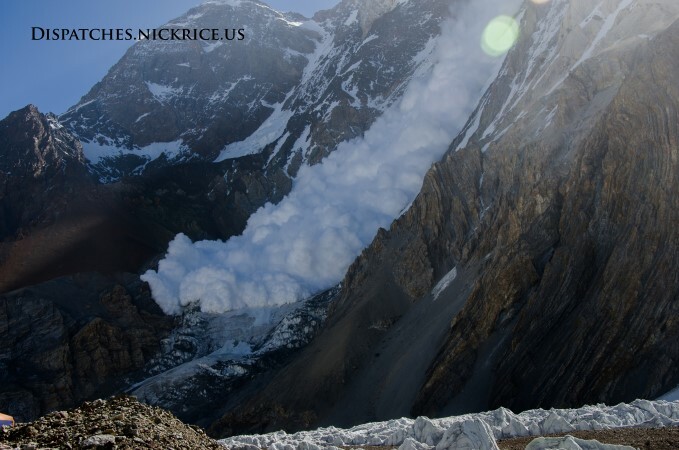 They congratulated us, took our backpacks from us to our profound relief, and walked with us the last hour to Base Camp. We arrived, ate a quick dinner, which was followed by a very unpleasant conversation initiated by our Liaison officer. He decided to take the opportunity to argue over our choice to descend via Gondogoro La. 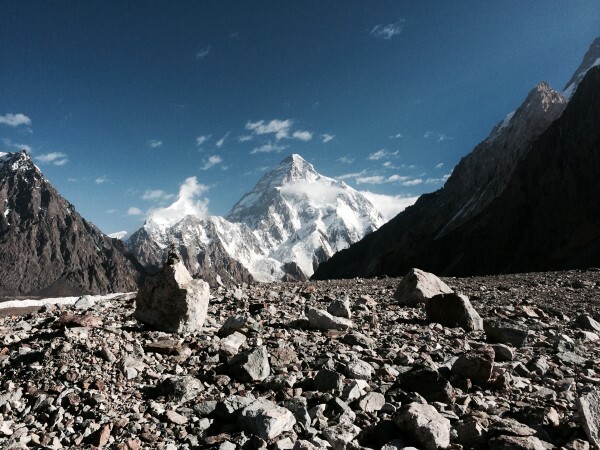 Apparently, while we were up on the mountain, other officers in K2 and Broad Peak base camps had convinced him of the danger of descending via the pass. Exhausted after descending from 8047m to 4800m, we were in no mood to debate the route of return. Disheartened, I returned to my tent, exhausted, burned, and sore from the huge effort that I had exerted over the past few days. I unpacked my equipment from my backpack and finally went to sleep. After maybe an hour of sleep, I woke up at 10:00pm, made 2 liters of water, packed up my things, put hand, foot, and toe warmers in my boots and gloves, and headed out into the moonless, pitch black night. About a half hour after beginning, I ran into Alex Gavan (Romania) who was descending from a successful summit attempt. I congratulated him and assured him that he was no more than 20 minutes from Camp III. We hugged and I continued toward Camp IV. I passed the Mexican tents in Camp IV, which were clearly empty and continued onward until I caught up with some Catalan climbers. A few of them were using oxygen, but their pace was erratic and it was very frustrating to be behind them, as their breaks were causing my extremities to get cold. To make matters worse, my headlamp died at around 2:00am, two and a half hours before sunrise. I had no choice but to stay behind the Catalans in order to use the ambient light from their headlamps to guide my steps. Finally, Oriol (a Catalan) and his Sherpa Nima passed the others and I took this opportunity to do the same, following Oriol and his Sherpa instead. Their pace was much better and a few hours later, we arrived at the col. My hands and feet were numb so I took the opportunity in the col (where the sun finally shined) to warm up and take a drink of my now icy water. I continued onward from the col, past a very rocky, exposed section, onto the rocky secondary summit. I met Lina and Pilar there and found out that Pilar was not feeling well and needed to descend. Lina had recruited a Sherpa to help them descend and they were departing any moment. I wished them luck, then continued on to the main summit. I bumped into Badia (Mexico) on my way to the corniced ridge and found out that she was returning from the main summit. Very few climbers actually made the additional hour and a half climb to the highest point. 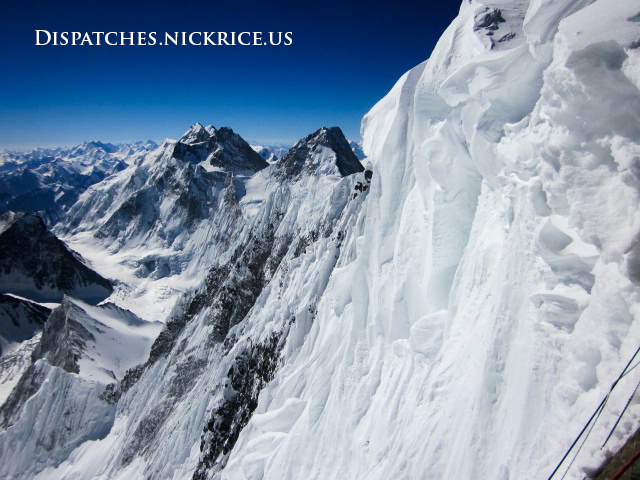 The winds picked up as I reached the ridge, making the journey evermore harrowing, and at 1:00pm, I reached the main summit (8047m/26,401ft) of Broad Peak along with Orial and his Sherpa. We took photos for each other, then quickly began descending toward Camp III. I arrived just before dusk and found Lina resting in the tent. She had some minor frostbite but besides that, was fine. Not long after I arrived, a Polish climber announced that a Taiwanese climber was dying and needed a rescue from Camp IV. I was completely destroyed from my summit bid and knew that I would be no help. 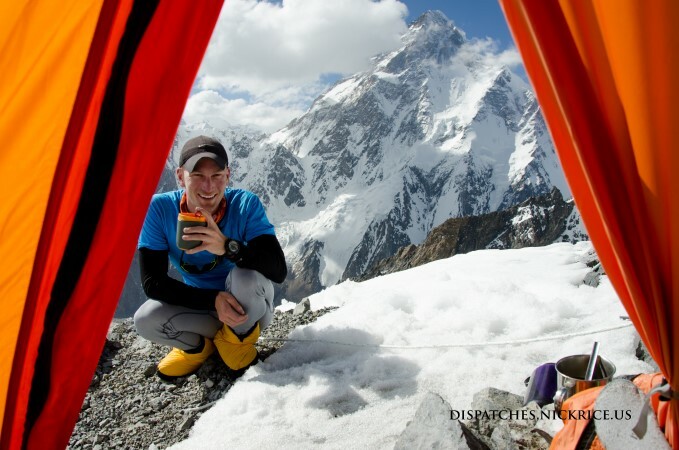 Lina left the Camp III tent, armed with her first aid kit, and went out to help the climber. After taking off my crampons, I quickly passed out with my boots and harness still on, feet outside the tent. Today, we woke up at 5:00am, prepared our equipment for Camp III and the summit, and departed for Camp III. We decided to stop in lower Camp III (6950m/22,802ft) instead of Camp III (7040m/23,100ft) today in order to allow our bodies to rest and better adapt to the higher elevation. 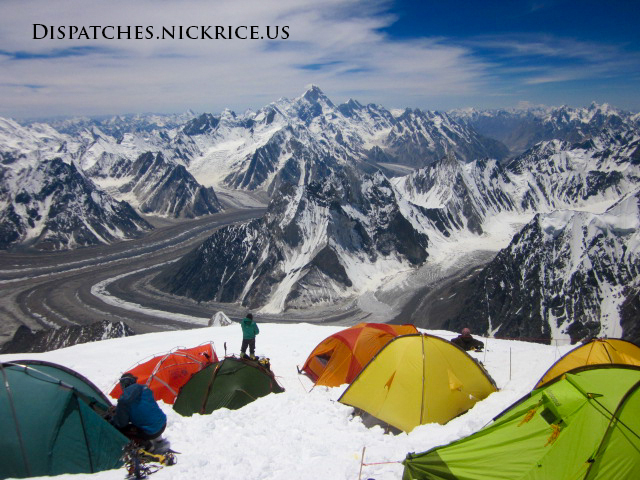 Typically, climbers would first sleep in Camp III, then descend to base camp, rest a few days, then go up for a summit bid. But since the weather window presented itself before we had the opportunity to properly acclimate, we instead decided to sleep lower the first night. We built in a rest day to our summit bid for precisely this reason. We spent the next hour and a half digging a tent platform into the icy slope among the decaying remains of old tents that had been destroyed or abandoned here in previous years. We had a Swiss climber and Taiwanese climbers as company. In the late afternoon, the winds picked up and as this was supposed to be the day with the least amount of wind, we became concerned that the forecast was inaccurate. 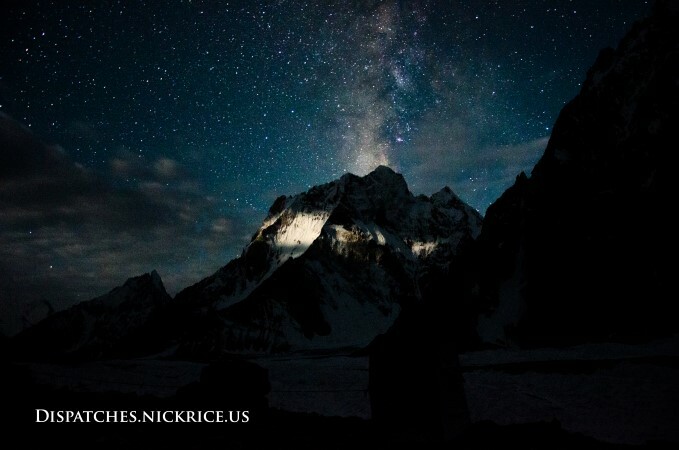 I confirmed via my sat phone that the winds had increased but were still tolerable for the next few days, then we made dinner and went to sleep after watching the Karakorum begin to glow red as the sun dropped behind the horizon. Today, we woke up to a beautiful, clear, but frigid morning, had breakfast in the mess tent, then began preparing our equipment for our summit bid. We were told by our liaison officer that Oscar’s expedition had called a base camp meeting to discuss the coming summit plans. I knew that this meant that his Sherpas wanted to charge everyone for placing the fixed lines above Camp III (bear in mind that they are already paid well to come here and would have to fix any lines that hadn’t already been fixed for their clients anyway). Reminded of the meeting before the summit bid on K2, I immediately decided not to attend. I prefer not to count on anyone doing anything for me above Camp III. We will bring a climbing rope with us on summit day, so if the need arises, we can rope up to cross any hazardous terrain that isn’t fixed. 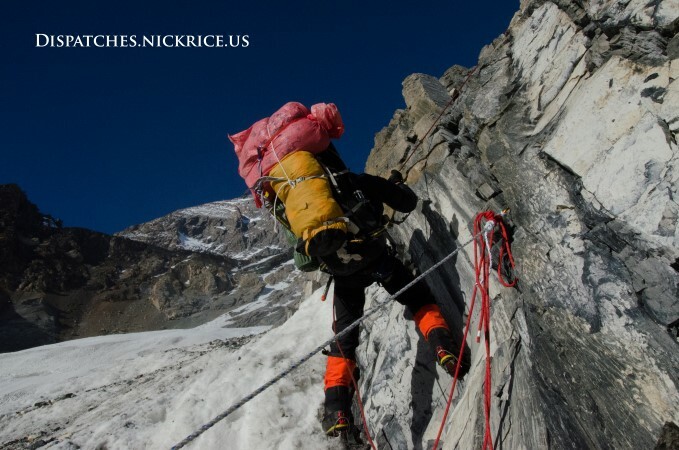 Anyway, by the time Oscar’s Sherpas arrived to Base Camp, the fixed lines to Camp III had already been put in place by the Bulgarian and Polish teams, so their request for payment for work to be done was ridiculous. The Polish team attended the meeting and informed everyone in attendance of their intent to fix the three crevasses above Camp III and the rocky summit. And of course they didn’t even think to suggest a fee for doing this work. 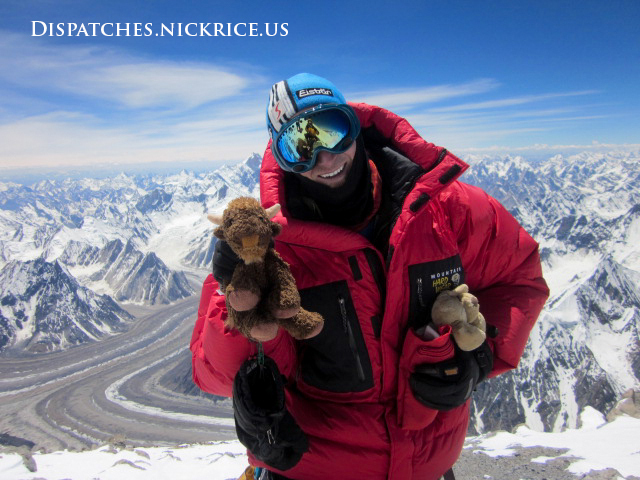 Oscar chimed in with a last attempt to earn some money by suggesting that his team had a doctor who would climb to Camp III and had brought oxygen in case a rescue was necessary. He suggested that everyone should pay a fee up front in case a rescue was necessary. Everyone in attendance found this suggestion ridiculous. If a rescue was indeed needed, the person rescued could either pay directly or use their rescue insurance to cover the cost. After the meeting concluded, I went down to the Seven Summits camp to visit Alex Gavan. We discussed plans for the coming days, wished each other luck, and went back to preparing our things for the summit bid. 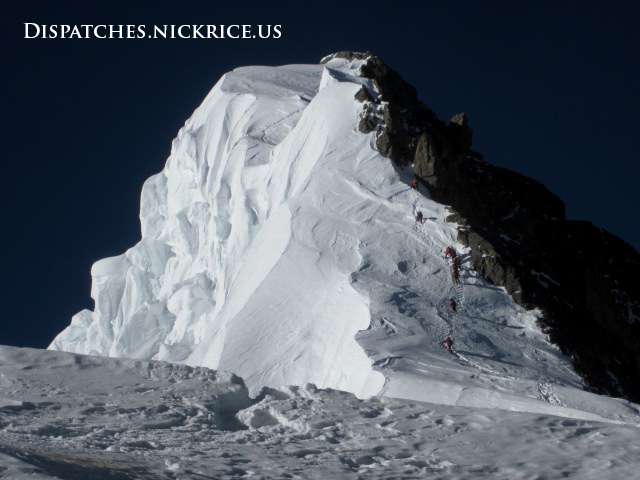 Our plan is to leave at 5am tomorrow (July 21st) for Camp II (6400m/21,000ft), continue on to Camp III (7040m/23,100ft) on July 22nd, and either spend July 23rd in Camp III resting or establish a Camp IV (~7400m/24,300ft) to shorten our summit day. If all goes well, our summit day will be July 24th. Today, we woke up to heavy snow in base camp and a heavy accumulation on the ground. We had breakfast in the mess tent, then took refuge in the kitchen tent with Ibrahim and Manzoor to stay warm. Around 11:30am, the storm broke and the rest of the afternoon was cloudy, windy, and cold. I went down to the seven summits camp where I visited with Alex Gavan, Tamara (an Italian climber on K2), Oscar, and Ana (Catalans). 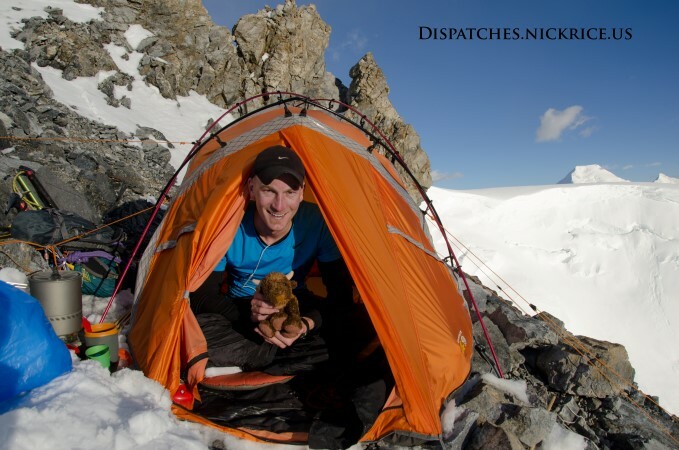 We discussed the weather and summit plans for a bit, then I rushed back to my camp for lunch. The rest of the afternoon was spent in our respective tents, the sound of big avalanches breaking the long periods of silence. It looks like the weather will improve on the 20th and will continue to get better till around the 26th. For the moment, I plan on beginning my summit bid on the 21st or 22nd, but the coming forecasts may change my plan as weather forecasts out past 3-4 days are notoriously inaccurate. Today, we woke up to heavy snowfall in Camp II. 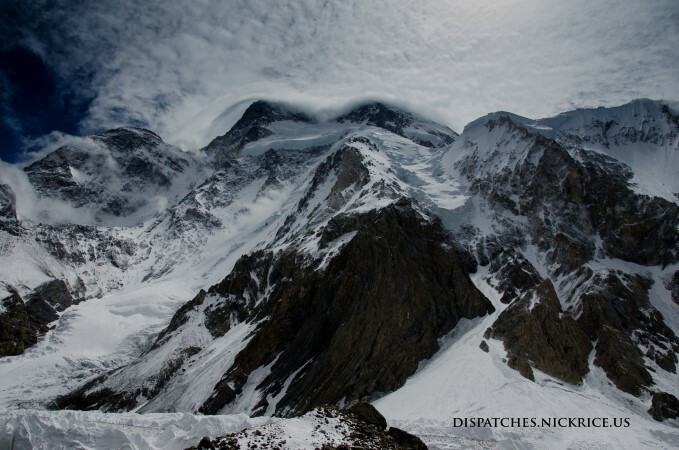 We began preparing for the climb to Camp III when the Hungarians arrived to our camp and told us the updated forecast. The bad weather had moved in early and the conditions up at Camp III were horrendous. Many of the fixed lines are buried under the new snow and the winds higher on the mountain were bone chilling. Lina and I discussed our plans for quite some time and finally settled on leaving a deposit in Camp III then descending to Base Camp. As we readied our equipment, the weather got worse. The wind picked up, the snow continued to fall, and visibility diminished quite dramatically. Despite all of this, we began up the slope to Camp III, and as we climbed higher, the temperature continued to drop and we finally threw in the towel and descended to Camp II. 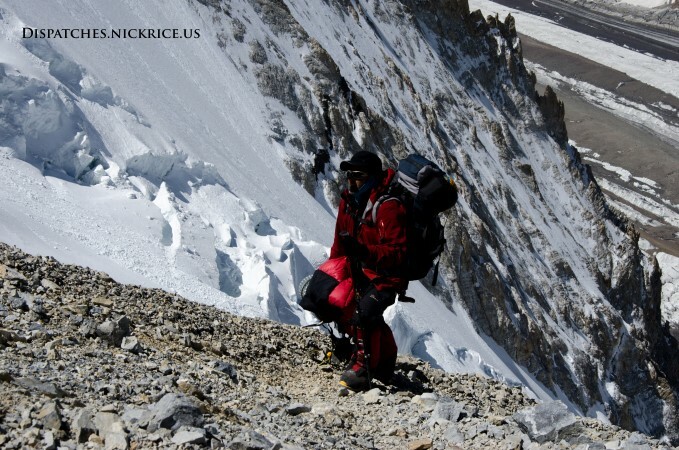 We opted to leave all of our equipment in Camp II, meaning that we will need to ascend directly to our high Camp II from Base Camp on our summit bid. Lina began descending while I further secured the tent to the surrounding terrain (our site is perched on a very steep, exposed ridge). We met up at Camp I and then at the deposit where we descended together. 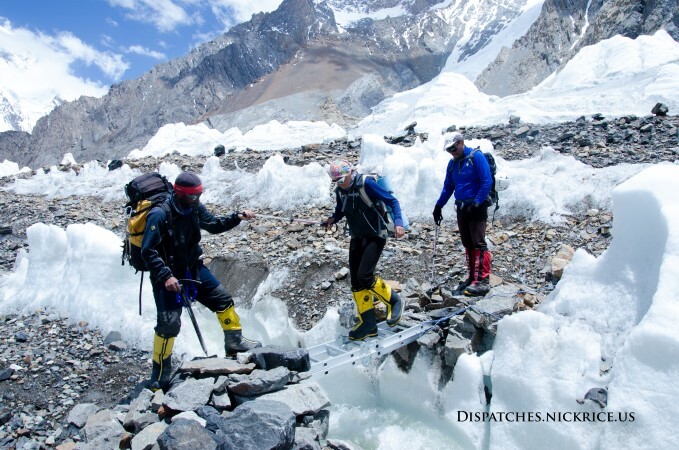 Despite the frigid weather above, the rivers at the base of the route were enormous and we were forced to cross them using ladders that had been precariously installed. Once across, we were met by Manzoor and Ibrahim, who offered us drinks and ushered us into the mess tent where we were quickly served lunch. We showered (and by showered, I mean we were given a bucket of water and a bowl and went to a tall, narrow tent to rinse off in the cold), then took refuge from the rain in our respective tents. Today, we woke up in Camp II at 7:00am, made breakfast, then packed up our things and the tent and headed up toward Camp III. 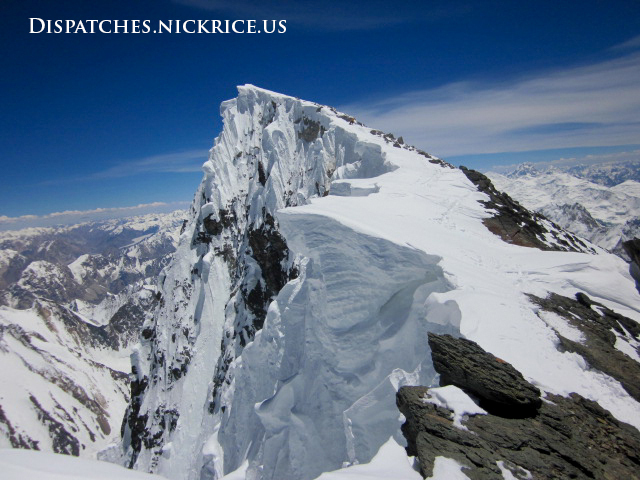 Around 6400m/20,997ft, we placed a high Camp II. We spent the next two hours digging out a tent platform and hacking at the ice that prevented the platform from being flat. While I completed the work on the platform and erected the tent, Lina headed back down to lower Camp II to collect the deposit she had left, and assisted Carlos in placing his tent in a new platform. I spent quite some time securing the tent to the surrounding rocks, then unpacked the equipment into the tent and began melting snow for water. Lina arrived and we spent the rest of the afternoon relaxing, discussing plans, and trying to replace the huge number of calories we burned doing work at this altitude. We decided that we will carry a tent to Camp III tomorrow and spend the night there.